Discounts based on the quantity of products in the order. 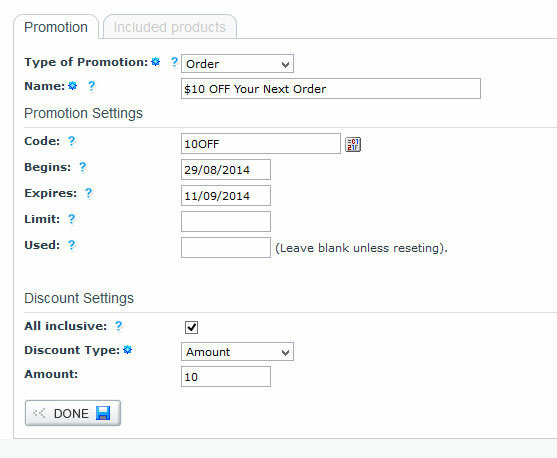 Here we outline how to configure some example promotions. Each of these instructions begins by logging into your admin and going to “Shop” > “Promotions” > “New Promotion”. The type of promotion is “Order”. “All inclusive” is checked because the promotion applies no matter what products are in the cart. The Discount Type is “Amount” and the Amount is “10” so that $10 is subtracted from the order at the checkout. The Discount Type is “Percentage” and the Amount is “15” so that 15% is subtracted from the order at the checkout. The type of promotion is “Quantity” because it’s based on the number of products in the cart. The promotion is specific to certain products so leave “All inclusive” off. The quantity is “2” because we’re basing this on 2 products. Save the details. STEP 2: add the products that trigger this promotion in this screen. The type of promotion is “Quantity” and the “Quantity” field dictates the number of products. Tick the all inclusive box so that the discount applies sitewide. 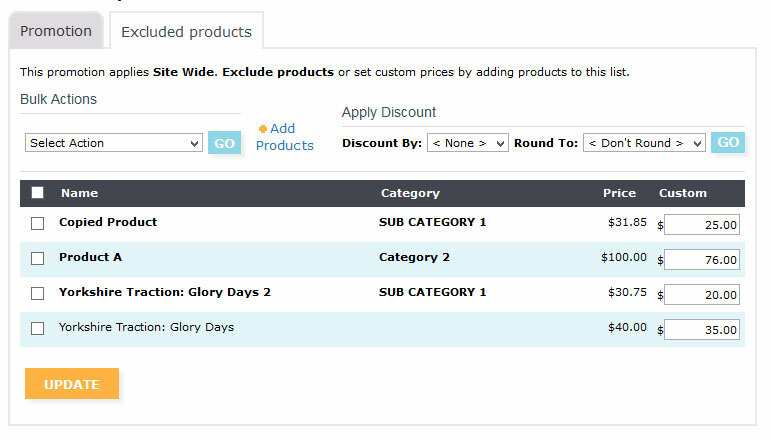 Choose the “Discount Type” as “Amount” and the amount of is 20… Put 20 in the amount field. Name (REQUIRED): Internal name to identify the promotion. This will be displayed at the cart and recorded on the order. Used (optional): This field records the number of times the promotion has been used. Administrators can reset this field at any time. If checked: This promotion will apply to all products in your website. 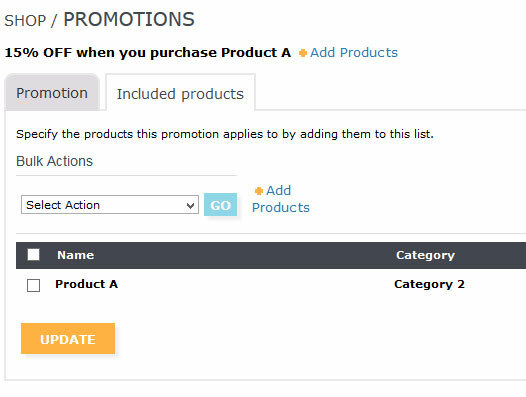 NOTE: You can exclude individual products from the promotion by going to the “Excluded products” tab and adding products to this list after you have saved your promotion. This promotion will only apply to products listed on the next tab. 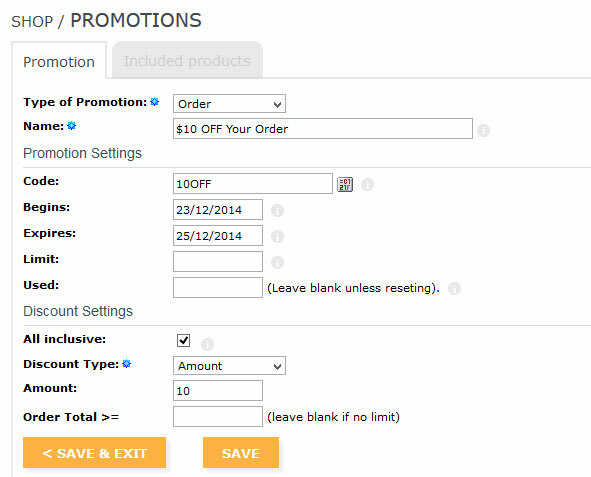 Save the promotion, and proceed to the Included promotions tab to add products and set their discounts. 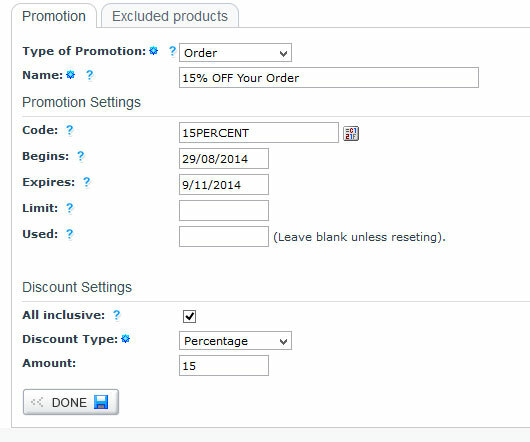 Amount (required for all inclusive and quantity promotion types): sets the amount to discount based on the Discount Type. 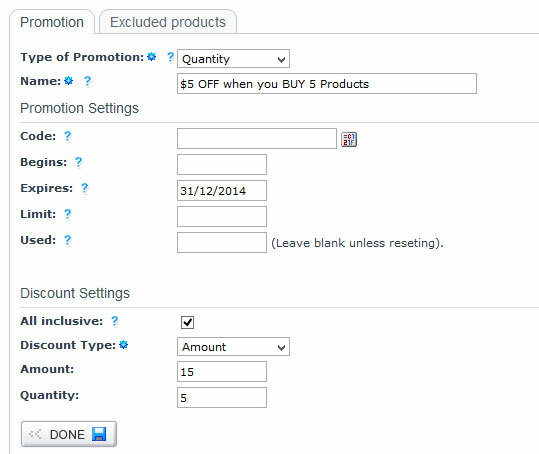 Order Total >= (“Order” promotion type): Sets a limit to the promotion, it will only kick in if the Total Cost of the order is over the set amount. Leave this field blank for no limit. This tab is available when your promotion is not set to “All inclusive”. 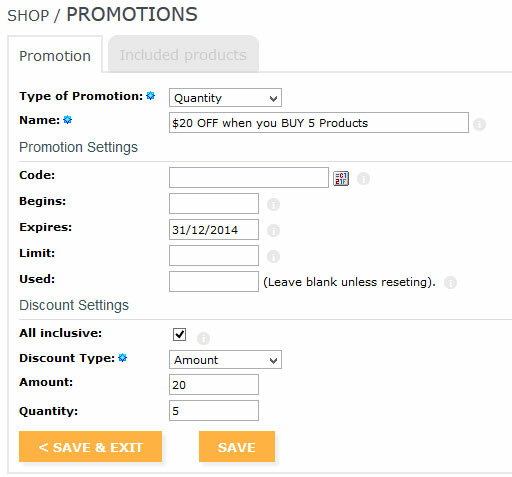 Include products in your promotion in this list and set their discounted price individually. This tab is available when your promotion is set to “All inclusive”. 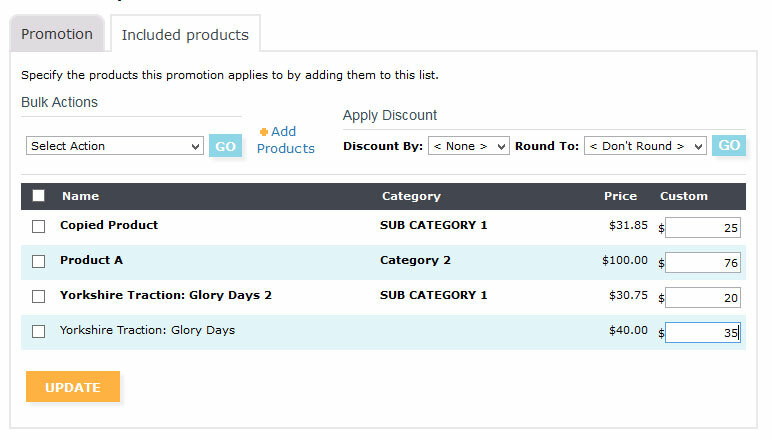 Exclude products from the promotion by entering them in this list, you can set a custom price for those products, or leave them the retail price. 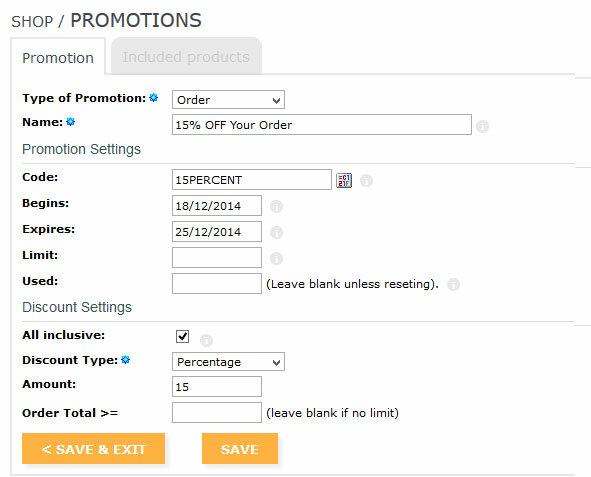 The promotion code box isn’t included on your cart page by default. To switch it on go to “System” > “Configuration” and tick the box “Include promo box” under the “Shopping Cart” sub heading. Only one promotion code can be redeemed at a time. 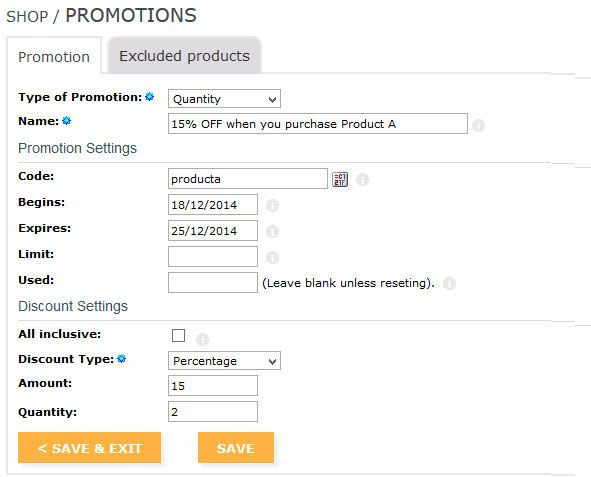 Open Promotions: When you create multiple promotions that don’t require a promotion code, it is possible that more than one promotion will run at a time. “Discount” promotions will be marked against each individual product whereas “Amount Off” promotions will be marked near the Cart Total.